Happy LAST DAY OF 2013, everybody! I hope you had a good year! 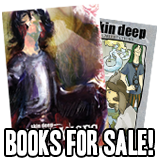 Today is the very last day of the Skin Deep Winter Sale, so if you want some CHEAP SKIN DEEP STUFF get in on that action! And have a happy new year! Man, I feel like I know that sort of feeling Ike has 4, 5, and 6 way too much. He’s a pretty cool older brother and I’m looking forward to see how this goes. I feel your pain, Ike. I really do. Also, I love his face in the first panel. I love Ike’s expressions in the first four panels. As contentious as his relationship with his mother is, it would be easy for him to project those feelings onto Cy as well, but he really is happy to see his little brother progress in his shapeshifting. Cy’s expressions in the first three panels are better, IMO. I wonder if their moving in going smoothly, will be the case should Rhonda have a discussion with Remy. Is… that one of the reasons why Alec is such good friends with Ike? The body-horrorshow that happens every time Ike shifts to human? >:=/> Also, was Ike living in the LA just so he could be away from his loving family and his peach of a mother? Ike: …Hey, Rhonda, what’s Bohemia like? D’you have a place there? Ever thought of moving back? Like soon? By which I mean now-ish? Rhonda: …Maybe. Would you care to go shoe-shopping with me now? Lee: Hey! I heard that, and I’m going to tell mother. Unless you take me too! Anyway, the New Year fireworks have just finished… so HAPPY NEW YEAR, EVERYONE!! Ha. At the very least Alec is among those who wouldn’t find the body-horrorshow a deterrent to friendship. And I’m pretty sure I read that Alec, Ike, and Remy all moved to the LA together, so Lynn Stanford’s charming personality was probably not the sole reason for putting some 150+ miles between London and themselves. Ike must have seen it as a major bonus though. Yes, and Cartman from South Park did a song about it! We have only just begun to experience Ike’s mother…. And I am already feeling the urge to cheerfully flush her down the toilet. She would give poor Stanley indigestion, and such a sweet sea monster doesn’t deserve to suffer like that. You want to flush toxic waste such as Ike’s mother down the toilet? The one whom I’d to see Ike’s mother fed to, as a snack, is Bloodcarver. The tidiest way to… deal with… her, would be to dump her, without any supplies, in the middle of the Nullabor, at the height of summer. Sadly, sometimes sacrifices must be made for the greater good. She wouldn’t fit after that, would she? Like a trail marker in the center of the Gobi. I’m dying to see what Ike looks like as a human now. He was depicted that way in “The Bugbear Talisman”. Welp. Shows how much I pay attention. Check out “The Bugbear Talisman.” We see him human in that story. Question–I just noticed that his family all appear to be white or pale at least, but Ike himself, seen in Bugbear Talisman, is very clearly POC. How do human genetics play into this, if at all? Maybe his manticore dad is black? If I recall correctly, though, aren’t manticores monsters that can’t even shift? Or am I recalling this incorrectly? Even if his manticore father has a visible human race, he doesn’t look like he’s of African descent, but I could be wrong! I read Ike’s human form as more Mideastern than African, which works with the manticore being from Persian mythology. I have that album. I got it when it first came out intending to keep it as a collectible. All of Cy’s expressions here are amazing. How do you move a townhouse .-. With a Nemean Lion apparently. They aren’t moving a townhouse. Ike’s mom says they’re moving into a townhouse in the Avalon they bought. They need the Nemean lions as a moving crew for all their luggage, furniture, etc. I remember when almost this exact thing happened to a friend of mine. He quit his job and moved 600 miles away within a month of it. LOVE the expressions in the first three panels, both Ike’s and Cyan’s. SO perfect. However, I have to ask, why the changing issue for buggane? What makes metamorphosis an issue for the buggane more than for other creatures? Bugganes naturally have the ability to physically shapeshift. 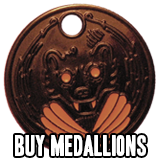 It’s a very different process from medallion use. I’ve kind of lost track of the sorts of people who can actually shapeshift as opposed to just casting “glamours” with amulets. Which ones do both? No species does both. Medallions were made to hide those who couldn’t hide themselves. Bugganes, for example, can blend in with the human population with nothing but their own innate abilities. All but the very young can switch from their natural state to a flawless human form, and mothers can give birth to children in human form (we can surmise the second fact from Ike’s backstory as told in Exchanges). The various species we see with medallions lack innate magic to do this, hence the need for outside help. The wiki is currently doing a pretty good job at cataloging the various species that appear a noting if and how they disguise themselves. Mostly true. Creatures that can look human don’t need medallions, but there are some who can change form in other ways that still need them. Nixies, for example, can make their tails into legs and back again, but they can’t look human without help. Cy, that cold feeling of dread should have tipped you off three comics ago. OOps. I meant Ike. Pity I can’t edit my posts. I KNEW IT! *Sings the doom song* Rhonda, bake some kind of cake for Welcome Wagon duties- a Black Beast or a Bublanina maybe. PLEASE. It’ll help. What is needed is the UNwelcome Wagon. I doubt a though nut like Lynn can be scared off. So, “Kill Them With Kindness”! BTW the foods I spoke of are Bohemian or Czech food food AFAIK. Lynn: Darling, that cake was delicious- and quite clever! I’d never have thought to make one that looked like meat! Rhonda: Thanks, it’s called srnci hrbet. Lynn: Srr- uh- um thank you. Now if only Petrus could cook. Ike: No I – oh yes. *Lynn: Dear, your father’s t-bone’s a bit overdone. But at least you didn’t burn them. tough nut i mean. 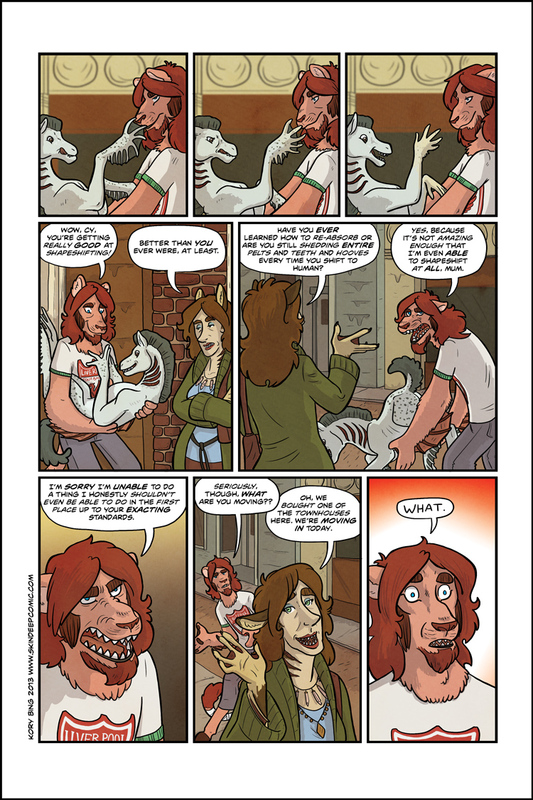 and everyone knows manticores like meat.. As Kory could probably tell you srnci hrbet is mock-saddle-of-venison cake. Joe, those desserts do look tasty indeed. Far too NICE for someone like Lynn, for whom we need ideas for the Unwelcome Wagon. Considering the title of the chapter, I expect said approach will be more effective, especially if it annoys the hell out of them. And now what is Lee’s opinion about his older half brother? I wonder what Lee has to say, he’s been awfully quiet. I love that softening Ike’s expression goes under. As pissed as he is from direct contact with his mother, he can’t stay mad when Cyan is doing something adorably cool. I have a friend. He is my bestest of pals. He feels the same way Ike feels towards his mother, except towards his whole family, excluding one or two of his cousins. When I showed him this page in context, he visibly cringed and pronounced it his worst nightmare.